A wood panel slides over the TV screen. We’ve seen a lot of ways to conceal televisions, but this is one of the most ingenious—and period appropriate. It’s in a summer cottage on Crane Island in Lake Minnetonka, a community with mostly vintage getaways. This one, however, was built in 2015, designed by David Heide Design Studio to look as if it might have stepped out of the early 20th century. 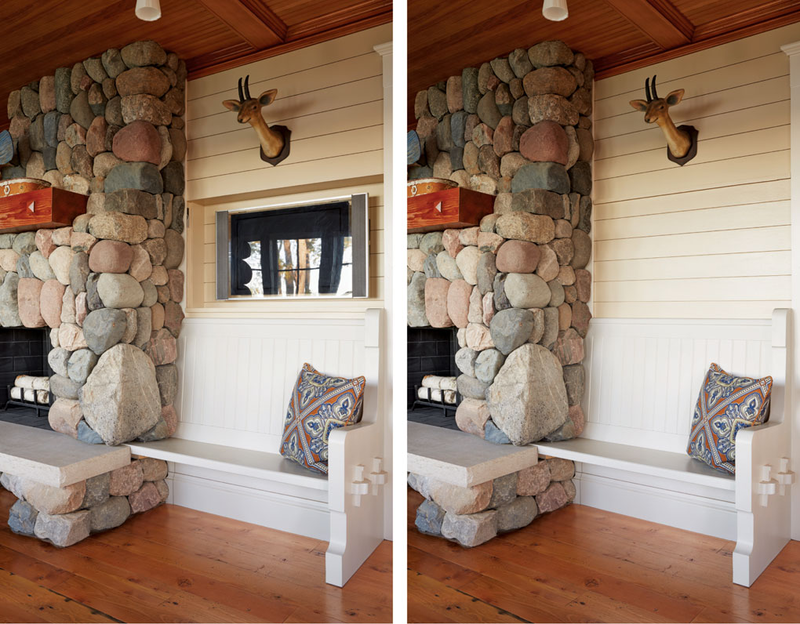 The illusion continues in the living room, where a period bench nests beside the drystacked fieldstone fireplace. Heide employed low-tech sleight-of-hand to conceal the TV when it’s not in use: A counter-balanced pulley-and-weight assembly from an old double-hung window allows a wood panel to be easily raised and lowered in front of the TV. Recessed into the wall cavity, the screen itself is mounted on a folding arm.